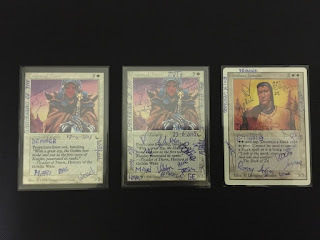 Most of us have, at some point or another, experimented with creating our own Magic cards. Be it in notebooks, with scissors, with pens, or by using one of the fancy tools of the information age. These are ways for us to express creativity within the boundaries of our own play group (or in some cases - like with Mox Crystal - for our home made formats). But once, in 1996, a small group of people took this to the next level. They created a full new set, got it acknowledged by WotC, and even held a release event for the expansion. This set had some prominent people working on it. Artist included Jeff Brain (who made the art for the spellground playmats), it was published by Japji Khalsa, and it was designed by Donald X Vaccarino who later won Spiel des Jahres for his card game Dominion. Donald X was also a designer friend of Richard Garfield, and is one of the guys credited with the 6th Edition rules; the rule set that introduced things like "the stack" to the game.